Hotel SOA is a newly built object with high-quality service and environment, and is situated in the very heart of Zabljak tourist resort. The contemporary architecture with transposed elements of traditional architecture of the Mount Durmitor is a characteristic of the hotel’s style, which falls into four-star category. With its top quality service and amenities, the hotel invites guests to experience the unspoiled natural beauty in the surroundings of mountains, lakes, rivers and canyons in the National park Durmitor. The hotel Soa is situated on the first kilometer of the road towards the most visited attraction in Zabljak - Black Lake. The hotel features 18 accommodation units (rooms, studios and apartments), offering a complete comfort and convenience. Choose the best for you. 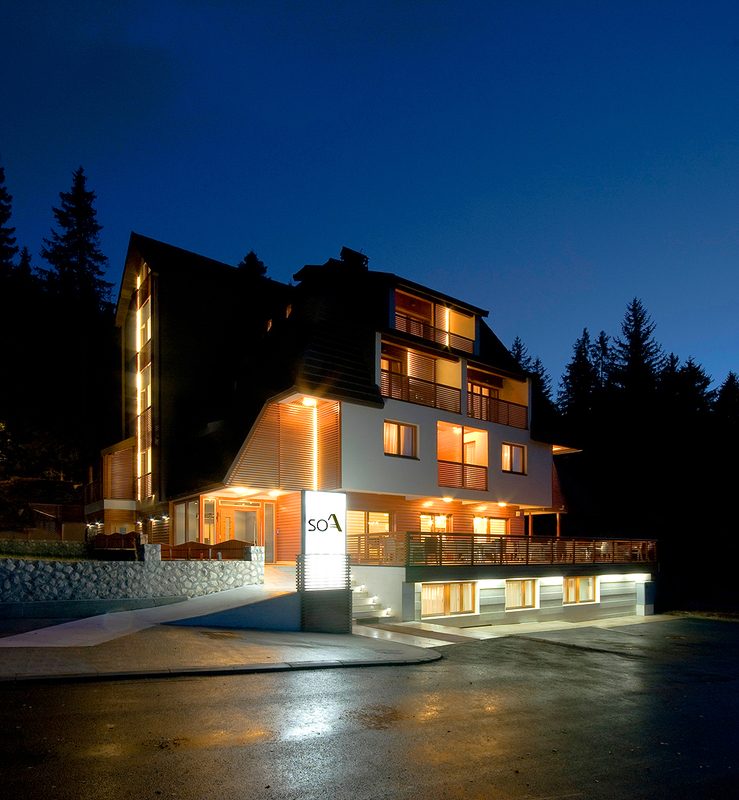 The hotel Soa is situated on the first kilometer of the road towards the most visited attraction in Zabljak - Black Lake. The favorable location of the hotel Soa gives guests the opportunity to visit all major attractions in its vicinity by only 10-minute walk. The hotel itself is tucked away and surrounded by conifer trees, with a magnificent view of the mountain range. The SOA offers a wide choice of national and international specialties. Depending on your wish, you would be served in a Lounge bar, in an elegant restaurant or in one of our terraces. Want to relax from a quick lifestyle and accumulated stress? Relax in our mini Spa Center. We offer various forms of relaxation, detoxification of the body, and body care. Our Spa includes Hamam - Turkish bath, Finnish sauna, shower and massage room..